The same procedures are used to inactivate users and roles. However, when a role is inactivated, the members of the role are inactivated, not the role entry itself. For more information about roles in general and how roles interact with access control in particular, see Chapter 6, Organizing and Grouping Entries. The root entry (the entry corresponding to the root or sub suffix) on a database cannot be inactivated. Chapter 3, Creating Directory Entries has information on creating the entry for a root or sub suffix, and Chapter 2, Configuring Directory Databases has information on creating root and sub suffixes. The Directory Server uses dual scripts to inactivate or activate entries through the command line. The ns-inactivate.pl and ns-activate.pl script share similar options to identify the entry to modify, as listed in Table 14.10, “ns-inactivate.pl and ns-activate.pl Options”. [root@server ~]# /usr/lib/dirsrv/slapd-example/ns-inactivate.pl -D Directory Manager -w secret -p 389 -h example.com  -I "uid=jfrasier,ou=people,dc=example,dc=com"
[root@server ~]# /usr/lib/dirsrv/slapd-example/ns-activate.pl -D Directory Manager -w secret -p 389 -h example.com  -I "uid=jfrasier,ou=people,dc=example,dc=com"
-D The DN of the directory administrator. -w The password of the directory administrator. -p Port used by the server. -h Name of the server on which the directory resides. 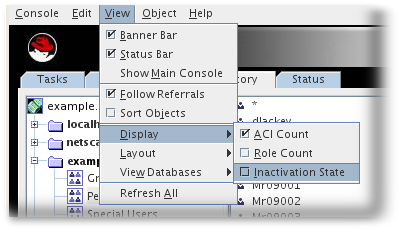 -I DN of the user account or role to inactivate or activate, depending on the script. For more information about running the ns-inactivate.pl and ns-activate.pl scripts, see the Directory Server Configuration and Command-Line Tool Reference.